The guided walks and tours featured are suitable for most levels of fitness. If you have any concerns regarding the fitness level required for a particular tour, please advise us at the time of booking, as we can customise the tour to suit your requirements or recommend an alternative tour. Tours include pick up and return transfers within Rotorua City, admissions, picnic lunch and refreshments included in full - day tour packages. 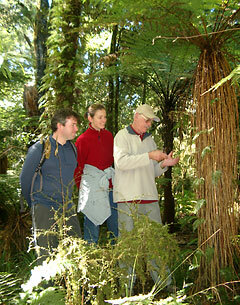 Nature Connection NZ tours are professionally guided by friendly knowledgeable guides with informative commentary on the regions rich Maori culture, history, geology and NZ’s unique native flora and fauna. We recommend for safety and comfort reasons that clients wear/bring suitable clothing for the activity, comfortable walking boots/good quality walking shoes, windproof and weatherproof parka/jacket, warm hat/sun hat, sunscreen. We are committed to quality rather than quantity.